Choosing a gold pan is something that many prospectors don’t really give a lot of thought to. This is most likely because gold pans are fairly inexpensive items, and at first glance they all seem more or less the same. However, if you take some extra time to choose the proper gold pan , you will significantly improve not only your success in finding gold, but your overall enjoyment of the hobby as well. So let’s take a quick look at a few of the things you will want to consider before choosing a pan. 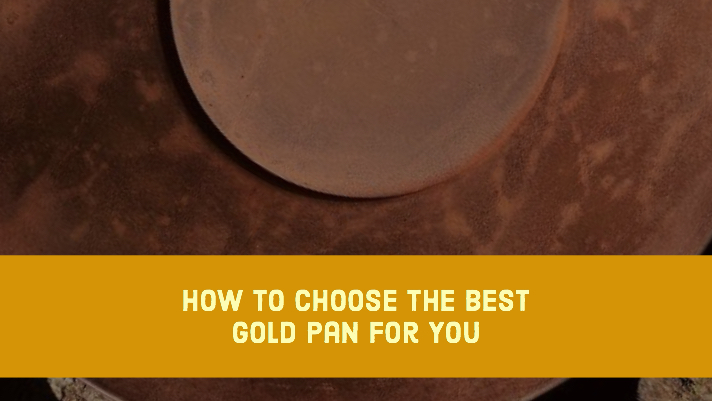 The most important thing to consider when selecting a gold pan is its size. Gold pans come in many different sizes, with diameters most commonly ranging from 10” to 18”. Many beginning prospectors make the simple mistake of picking the largest gold pan that they can get their hands on. After all, we all know that the more material that you can process, the more gold you are likely to recover. The problem with these large pans is that they are just too much for the average prospector use comfortably. When an 18” pan is loaded up with gravel, it gets very heavy and tough to maneuver, turning the pleasurable experience of gold panning into a real chore. Now if you are a large man in good shape, maybe the larger sized gold pans are ideal for you. However, most children, women, and most men will probably find that a small to medium size is a better choice. To figure out which size is best for you, lay the gold pan face down on the inside of your forearm. With one edge of the pan at you elbow crease, look at where the other side of the pan is. Does it extend past your fingers? If so, then it is definitely larger than you want. The ideal pan will fit from the crease in your elbow to somewhere around your knuckles. Remember that a gold pan should be used more as a sampling tool than for large-scale prospecting anyways, so save your back and go with a smaller size that will make panning a pleasurable experience. Plastic Pans are the Way to Go! Another choice you have is whether you want a plastic or metal gold pan. Of course, we all know that the metal gold pan was the sampling tool of choice used by the old timer prospectors many years ago, and certainly there has been a whole lot of placer gold pulled out of the creeks and rivers with these pans. With that said, modern plastic gold pans have many advantages that should be considered before making your purchase. One of the biggest advantages is maintenance, or lack of. Metal gold pans will rust if put away wet. I know that I am often tired after a long day of prospecting and forget to do something simple like drying off a metal gold pan. A few days or weeks later and you have a real mess on your hands. With a plastic gold pan , there is basically no maintenance involved. You can toss it in your backpack and forget about it for a few weeks without having a rusty mess on your hands. Plastic gold pans are also ready to use straight out of the box, while a metal gold pan requires some preparation to remove factory oils. Plastic gold pans also have built in riffles, which will really help you retain some of the smaller flakes of gold, an added bonus for a beginner who is still learning the basics of gold panning. Plastic pans will also come in various colors that can help you spot those little specks of gold in the bottom of the pan. You will find that there are many different pans on the market. Some have slightly different shapes, they will come in a variety of colors, and most manufacturers will claim that their model is the best for retaining gold. More important than anything is selecting a gold pan that you are comfortable using, and panning in a spot that has potential to have some gold. Once you’ve done that, all that is required is a little hard work and you will have a good chance of finding some gold.